Il Prisma Trend Analysis is a team of innovation researchers with forward thinking mind sets, identifying the drivers which are transforming today’s market. Leveraging our extensive knowledge of the creative industries, we offer our clients a worldwide panorama of the changing future, identifying new opportunities and bringing innovation to life. Macro retail trends are emerging trend frameworks, which have been identified annually based on economic, social, cultural and technological changes. 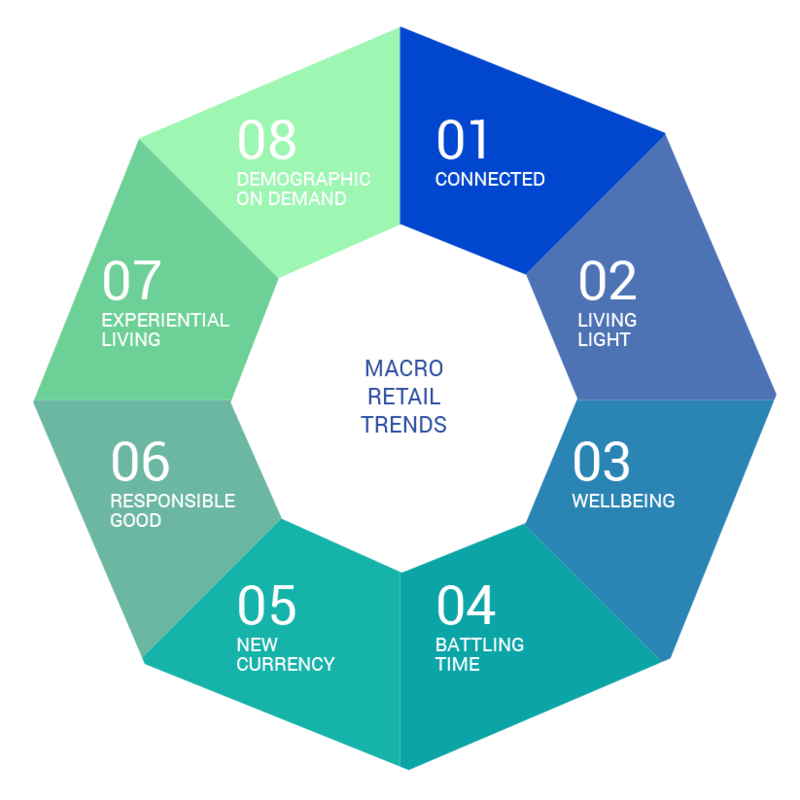 Macro retail trends examines 8 top trends impacting retail industry. The new digital technology culture is increasing self-knowledge and accessibility providing new tools that empower a degree of ease. The increasing level of connection is evolving boundaries between physical and digital creating an immersive experience. Consumer mindsets and definition of value is changing. Consumers are increasingly finding alternatives to personal ownership of a product or services questing for more sustainable world through ethical consumption. omnipresent companion to their every day lives. Urbanization world of high-density living and fast paced busy complex lives are driving demand for convenience, flexibility, smart commuting to help use their time meaningfully to enhance the quality of their lives. Revolution of peer power is transforming the consumers lives towards building communities through access of networks of peers from buying, selling, renting, paying, resources, services and knowledge. Consumers are increasingly becoming value conscious, seeking moments of reward and maximum benefits. Value for money remains a top priority for consumers. Knowledge is one of the most important resources today. Learning new skills and knowledge through various platforms allows individuals, communities to empower and grow. Today’s consumers consumption patterns are no longer defined by traditional demographic segments but according to lifestyles and tastes. Lifestyles are becoming ever more flexible and unpredictable with new combinations are appearing. consumers are becoming forward-thinking seeking for new experiences that are engaging, sense-evoking and in turn generating new values. Retail View provides research insights covering 15 industries extracting and highlighting the most significant ground breaking innovation influenced by emerging macro retail trends. We help our clients see things differently by stretching and shaping their thinking of their business with monthly updated. Our Retail View reports aim to move the minds of our clients with business innovation. We organize a selection of workshops to fit different client's needs, transmitting Inspiration, Innovation and Activation. The workshop helps our clients rethink and shape the future of their industry. Together with our external network digital partners, we offer in-depth integrated insight on the physical & digital evolution. We work collaboratively with our clients exploring new business opportunities through cross-sector business. Want to organize a talk about how to stay ahead? Il Prisma Retail a division of Il Prisma Milano S.p.a.